Two games into an MLB season is way too early to make any judgments. Hell, two months into a season still feels a little too soon. With 160 more contests ahead, there’s no sense in fretting over a development taking place before the season is even a week old. 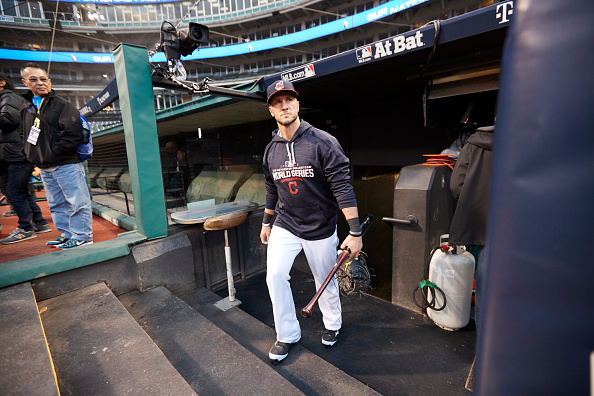 With that said, allow me to make a judgement about the Cleveland Indians just two games into the 2017 season, specifically about starting catcher Yan Gomes. After two nights against the Texas Rangers, Gomes has collected zero hits in seven at-bats and hasn’t seen life past first on the base-paths. If it weren’t for a walk last night, he’d know nothing but the trek from the dugout to the batter’s box. As mentioned, two games doesn’t indicate how anyone’s season is going to go. For all we know, Gomes may start off a lengthy hitting streak in tonight’s series finale. At the same time, I’d be lying if I wasn’t concerned about Cleveland’s catcher despite how little progress we’ve made in the 2017 season. If you’re wondering why I’m already anxious about Gomes this year, look no further than how things went for him last year. 2016 was essentially a Murphy’s Law season for the Brazilian. He often looked lost at the plate, finishing the year hitting a paltry .167. It was a far-cry from the .294 average he put up in his breakout 2013 season. Things hit a head when, in 13 games played through the month of July, Gomes only had two hits. This, of course, was about the time things went from bad to worse. A freak shoulder injury sidelined him over two months. His return was postponed after he was beaned in a minor league start and broke his hand. As you can see, 2016 was a year to forget for Gomes. Just a couple games into 2017, I’m not convinced he’s over such a miserable season. Look no further than his final at-bat in last night’s win against Texas. Twice in said plate appearance, Gomes crushed two long fly balls which looked like sure home runs, only to watch them drift foul at the last second. Instead of finally pulling one fair, he ended up striking out. The body language he showed – slumped shoulders and resisted temptation to try and break his bat – was alarming. It was the deflated reaction of a player who’s been mired in a month-long slump, and it was occurring in the season’s second game. Watching Gomes trudge his way back to the dugout, you just couldn’t help but question if his miserable 2016 campaign is still haunting him. If an entire offseason wasn’t enough to clear his head and put a difficult year behind him. On top of this, you have to wonder if the Indians’ recent contract extension of backup catcher Roberto Perez isn’t adding to the pressure Gomes is feeling. Suddenly, the team has made a decent investment in the man below him on the depth chart. I wouldn’t be surprised if Gomes read this as the team getting some sort of insurance in case he can’t get himself right this year. Again, though, we can’t read too much into Gomes’ 2017 performance due to the fact it only spans a handful of at-bats. Should these issues linger into May or June, then I’d say it’d be time to sound the alarm. Of course, that Gomes is still struggling to even look confident at the plate is a bit of a red flag. The initial hope was 2016 was just a blip on the radar. Now, you have to start wondering if it the first step on a downward spiral.